The Midterms are here and for many voting feels absurdly overwhelming and difficult, so we did something about it. Voting is hard for a number of reasons, but an inexcusable reason is information. We inhale more information in a week than Shakespeare did in his lifetime, so why is it that virtually no one has trustworthy and clear nonpartisan information on elections? Over at The Burg Quarters, we’ve been seeing the endless number of voter guides. While they can be helpful if you agree with the author, we feel a better future is where people aren’t told how to vote and instead they confidently & prudently decide themselves. 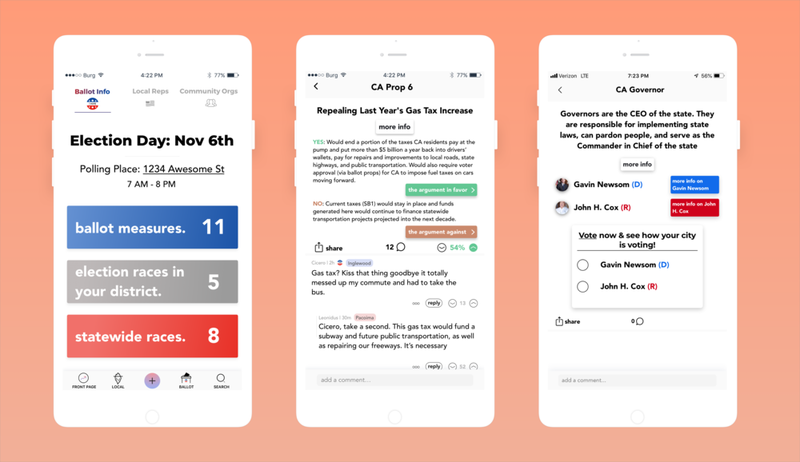 Dive into the details of every measure by accessing the arguments and background info provided by the awesome nonpartisan orgs Ballotpedia and Voter’s Edge. Discuss and learn from other folks across LA. Make a confident decision, and see how the rest of LA stacks up! 2. We know many of you vote purely based on how ~cool~ someone’s name sounds. Actually easily learn about who these candidates are and what they stand for. Most people don’t actually know what their Lieutenant Governor does or what a State Assemblyperson is. We give you the details of their job description, access to what they stand for, and then let YOU decide how to vote. Vote now directly in the app and bring The Burg with you to the polls as your sample ballot! 3. Don’t know where to vote? We got you. We throw in your polling location and let you call a Lyft or Uber straight from the app! Planning how and where to vote shouldn’t be hard. We even handle the final step: navigating you to your specific polling location! Don’t forget polls are open 7 am - 8 pm! We don't tell you how to vote, or what to vote for. We just make it easier.